I love soft tortillas. I love making tacos with them and I also enjoy rolling things like peanut butter, melted cheese into them or making a delicious wrap. I know the soft chewy white ones have almost no nutritive value, so I started buying the whole grain and even low carb tortillas. They were all right, but they were really expensive! So I found, and played around with, a tortilla recipe, and used freshly milled flour. 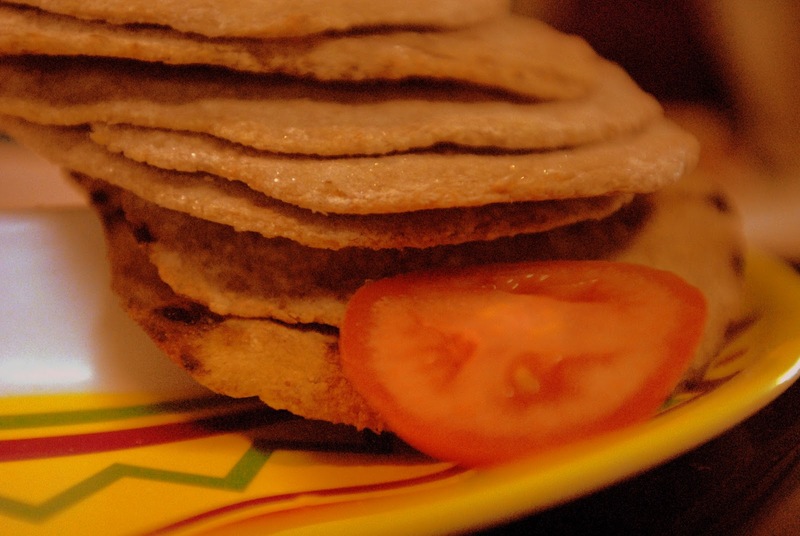 I use soft white wheat for these because even that has a pretty nutty, whole grain flavor and I don’t want to compromise the soft, chewy-ness of the tortillas I love. You could use hard red wheat or a mixture of flours if you want, I just haven’t tried it yet and really like it with the soft white wheat. Place all of the wet ingredients into your mixing bowl (I use a kitchenaid). Then add all of the dry ingredients. Knead the dough with the kneading hook for about 5-6 minutes. It needs to be kind of elastic for the tortillas. Let the dough rest for about 10 minutes. Take the dough and roll it into smaller balls. The size depends on what size tortilla you want. With this recipe I rolled about 12 tortillas. Roll the dough balls into tortillas. Heat a ridged skilled over about medium heat. It is ready when you splash water on it and the water sizzles. Place the flattened dough on the skillet and cook about 30 seconds each side. There should be nice brown splotches, but the tortillas should still be chewy. Note: if you cook the tortillas too long, they will become crispy!